Grayton Beach is simply a state of mind and pure paradise. The town of Grayton is a funky little beach town full of free-spirited folks with a laid-back attitude. The narrow roads are shaded by southern magnolias, towering pines and moss-draped oaks. The salt air is ever present and so is a good time at the newly remodeled Grayton Villa 101. Pull up on the gravel road to find a whimsical bright blue and yellow structure. First door on the right you will enter a lavish condo featuring all new furnishings and appliances. Stepping inside the home you will first find a brand new kitchen displaying top of the line granite countertops and stainless steel appliances. 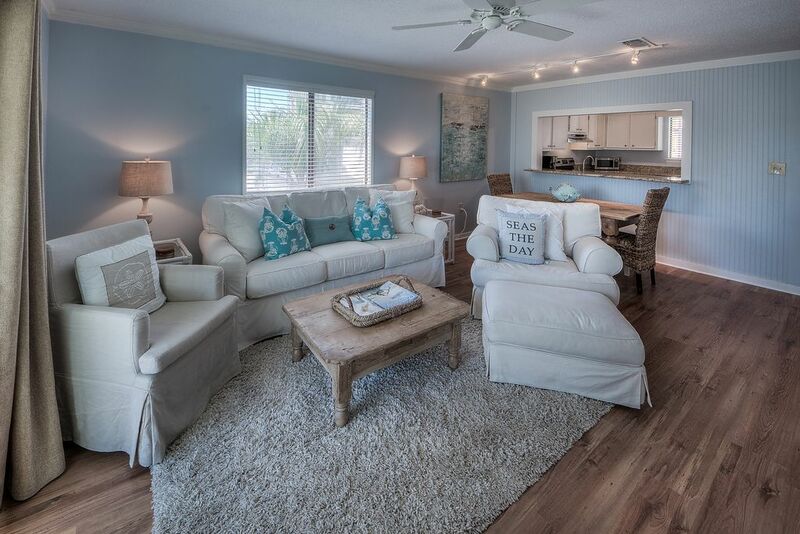 The open floor plan will lead you into the living room with sofa sleeper, a beautiful room headlining a white linen living room suit to relax on after a fun filled day on the white sandy beach. In the next room you will find a king bedroom along with a flat screen television. A large sliding glass door is also present in this bedroom for you to explore the porch overlooking the Grayton area. A short stroll down the hall and you will find yourself in yet another king bedroom, hosting a brand new king bed and flat screen television, you are sure to enjoy this comfy room. In between both king bedrooms you will find a newly remodeled bathroom just the right size to share with a large walk-in shower. Ready for the beach? Take a step outside to find yourself just feet from the boardwalk that will lead you to the crystal blue waters of Grayton Beach. Here you will find nothing short of a GRAYT time. Jeeps out for tailgating, friendly pups and awesome people are just a few things you will find out on the fine white sand. Walking distance to the famous Red Bar and shopping, Grayton Villa 101 is the perfect spot to kick back, relax and enjoy good company. Loved it!!!! 75 steps to the walkway down do the beach. We had umbrellas, chairs, and an ice chest and we had no problem caring it back and forth each day. 20 minute bike ride to Watercolor and Seaside. We will definitely book again. Well-situated in Grayton. Fun place. Nice place with very short walk to beach access. Clean and roomy. Will come back for sure! Thank you so much for choosing to stay with us at Sanders Beach Rentals for your vacation. We are all so thrilled that you enjoyed the location!! We would love to have you back down on 30-A soon! Great location in Grayton Beach. Great location and price. Easy walk to the beach or restaurants. This unit is not as nice/modern as some of the others in the same building that we’ve stayed in. When we arrrived the place was still dirty/dusty and the quilts had been sprayed with febreeze to make them seem clean :-(. The beds were uncomfortable and the old bathtub had black mold around the perimeter. The 1/2 bath was also poor quality. We love cooking in and while the kitchen has been updated, it is lacking variety of newer pots/pans + utensils for family meals. The deck furniture was also old/rusty. The positives are..you can’t beat the location, the A/C works really well and so does dishwasher. Also, easy keypad entry. Good location. Still needs work. The unit was clean for the most part but we will not stay in this unit again. Laminate floors and it appears the subfloor is sinking. The shower was. tiny and the shower curtain pretty dirty with not nearly enough bath towels. The furniture was nice and beds were comfortable but for the price we will pick a new place to stay next year. Sanders realty was great helping us with checking in.